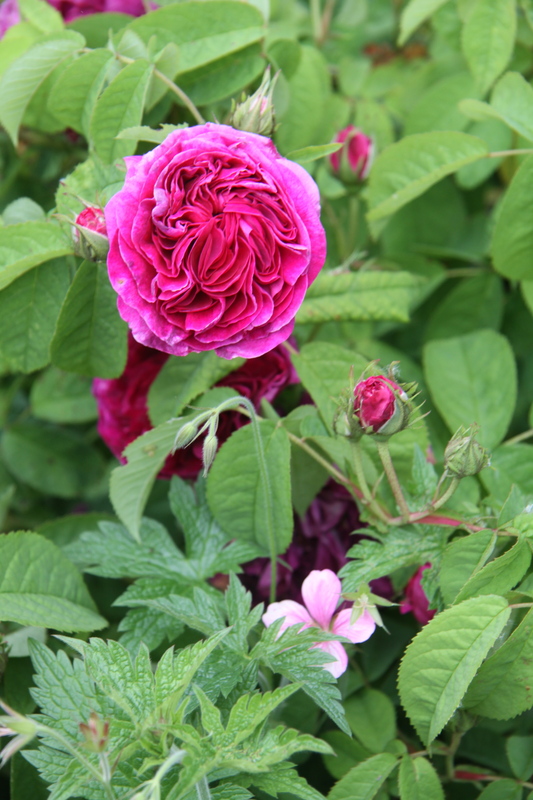 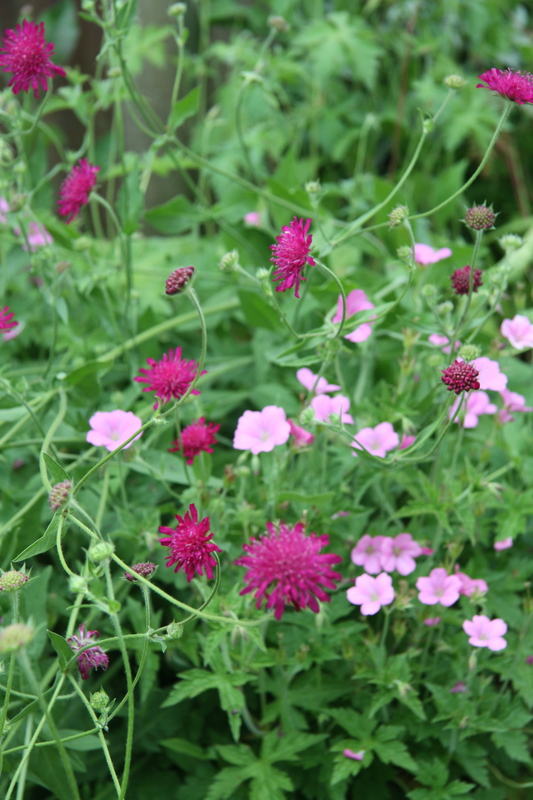 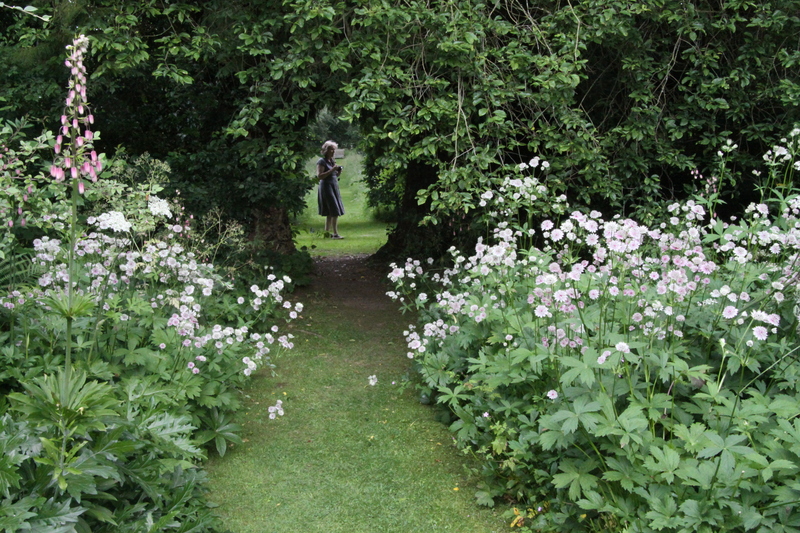 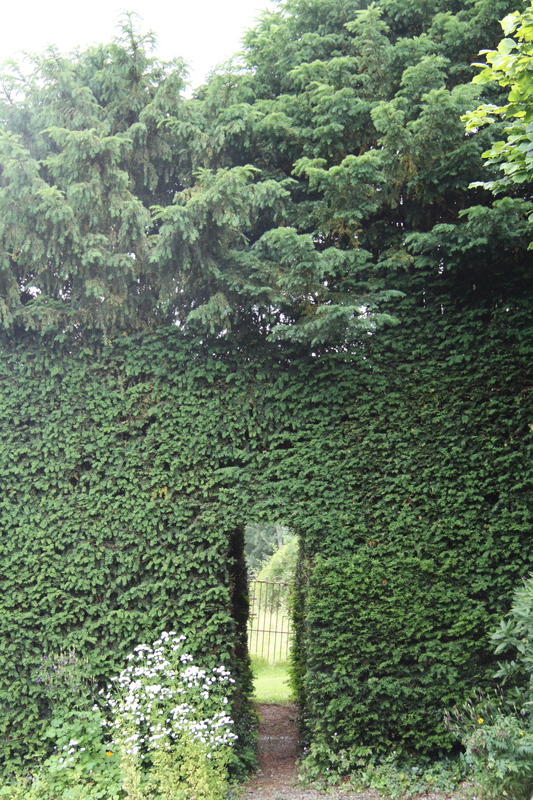 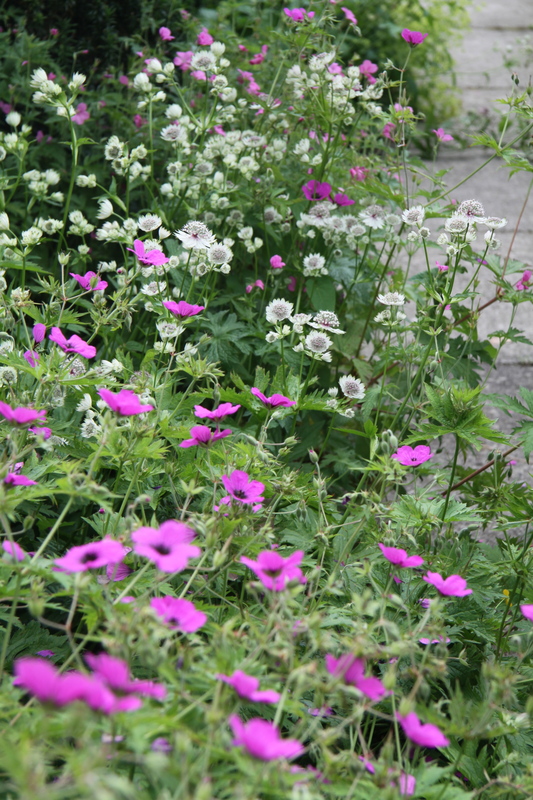 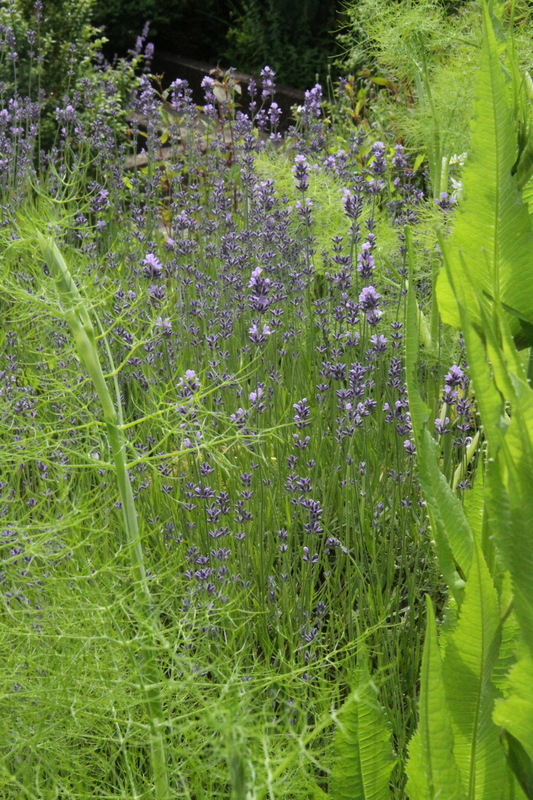 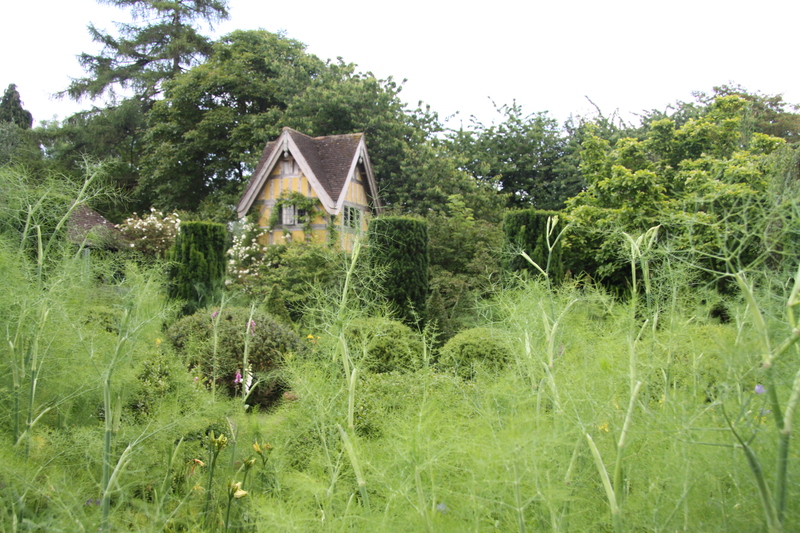 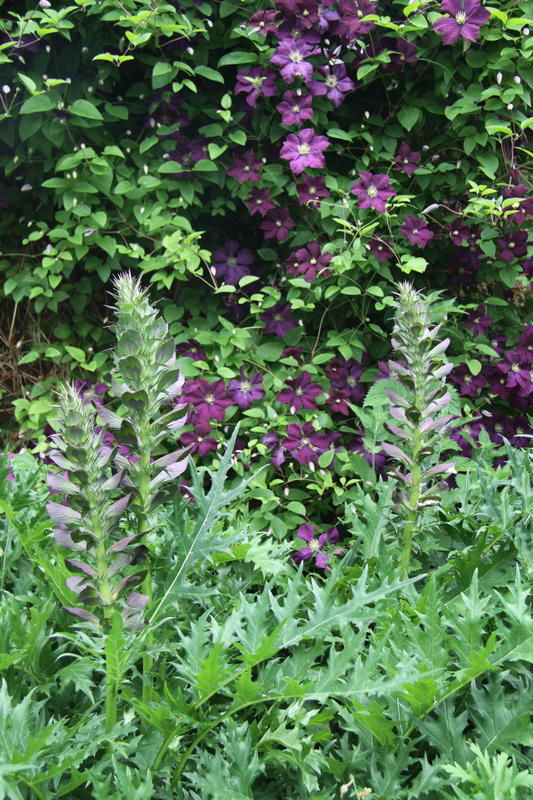 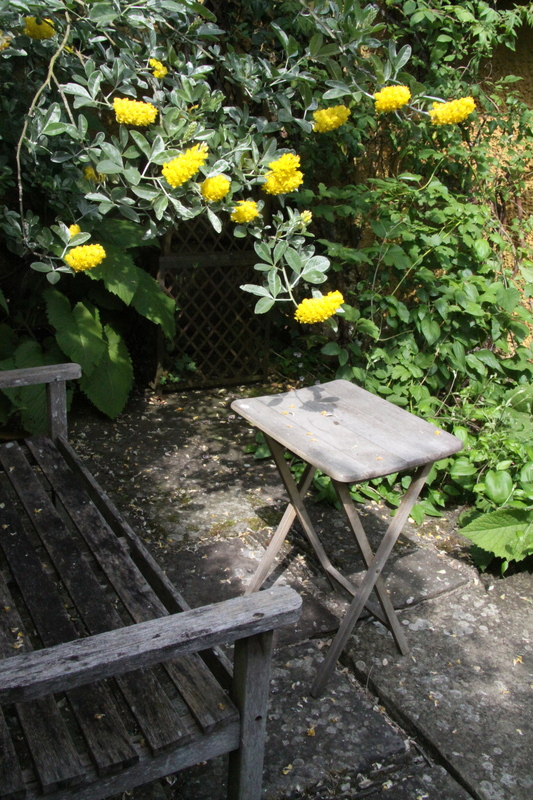 REVISITING A FAVOURITE ROMANTIC GARDEN IN MIDSUMMER – HAVE WE MISSED THE LATE SPRING MAGIC? 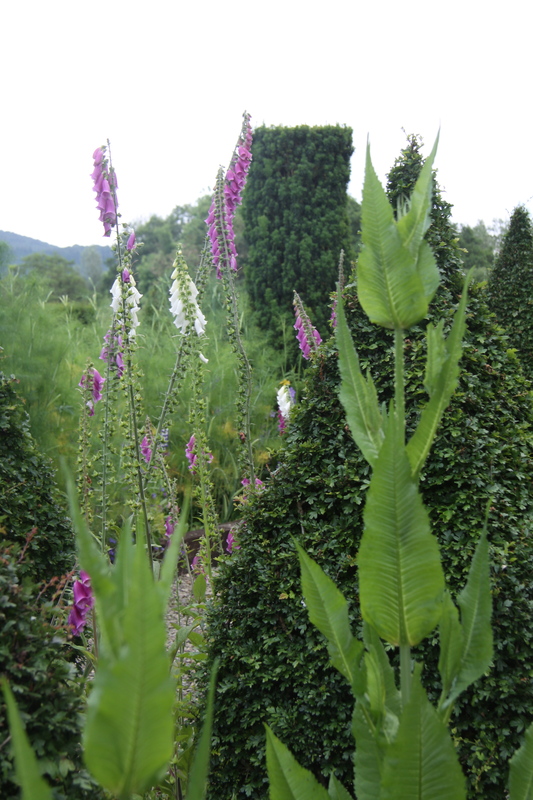 I have just returned from a works outing (well an end of project trip with my garden design partner, Helen ) to the Welsh Marches. 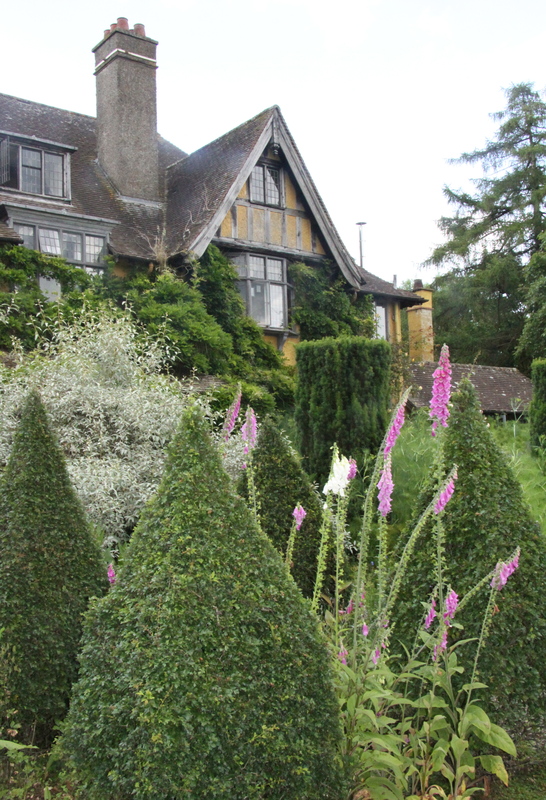 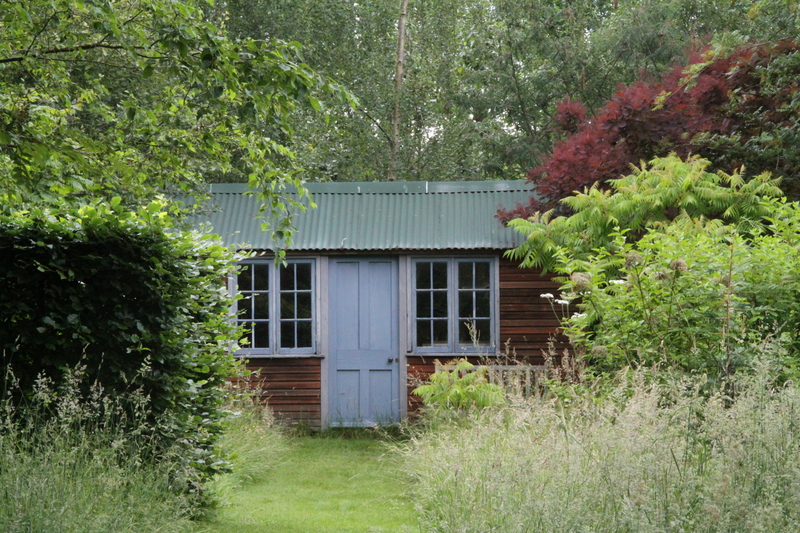 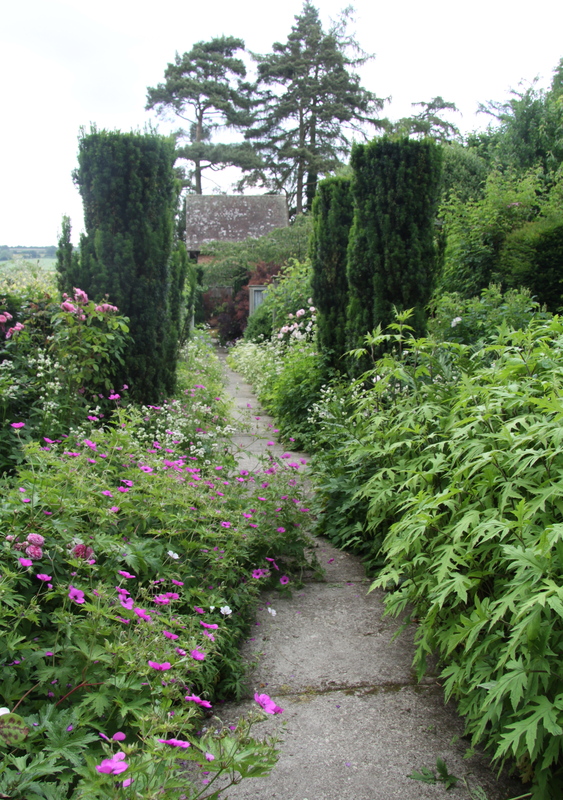 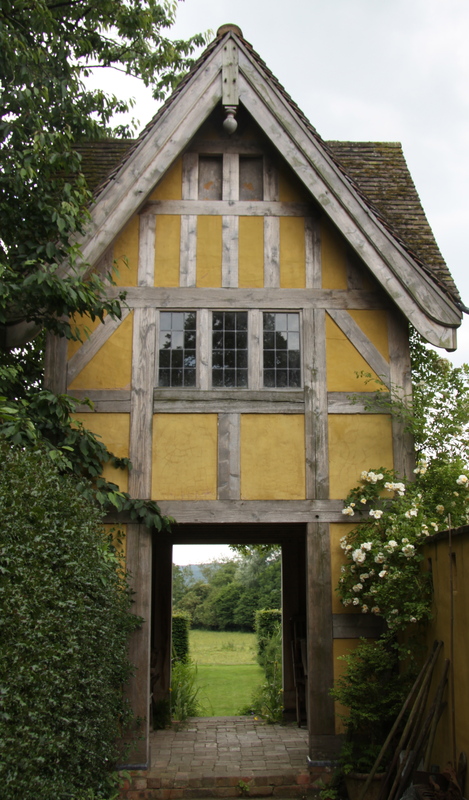 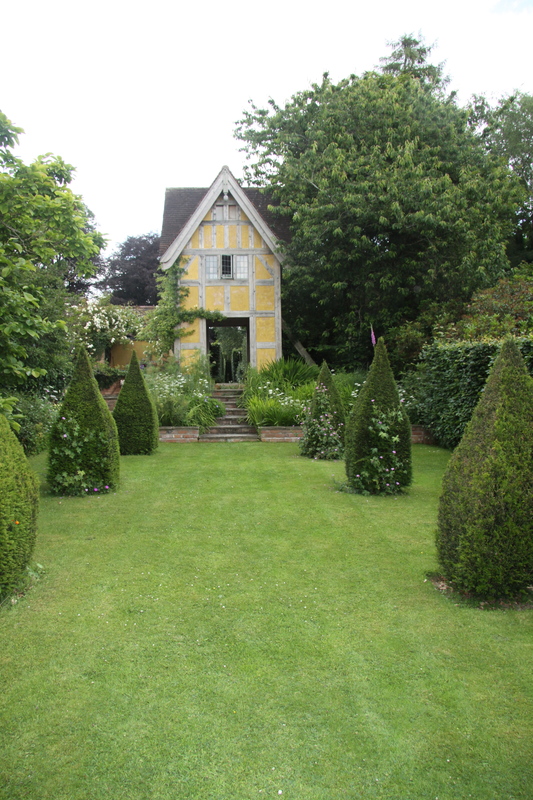 Top of our list of gardens to visit was a return to Bryan’s Ground near Presteigne in Herefordshire – three acres of intimate garden rooms and arboretum around a yellow painted 1912 Arts and Crafts House. 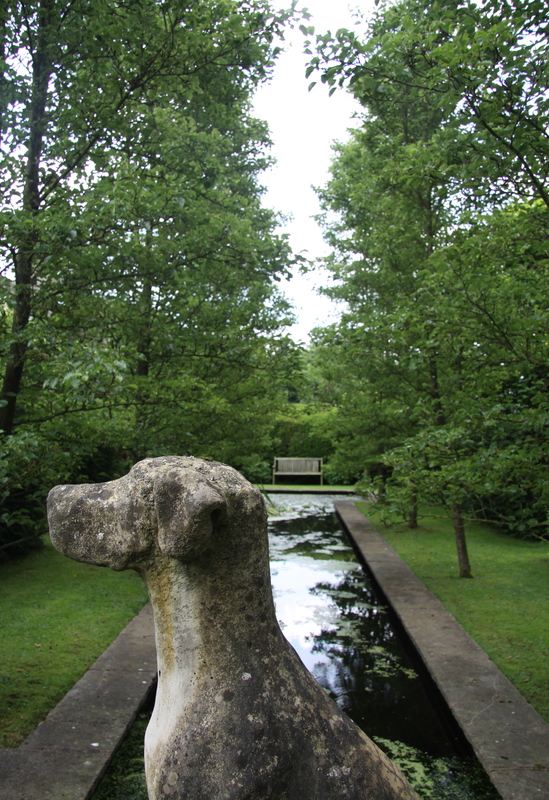 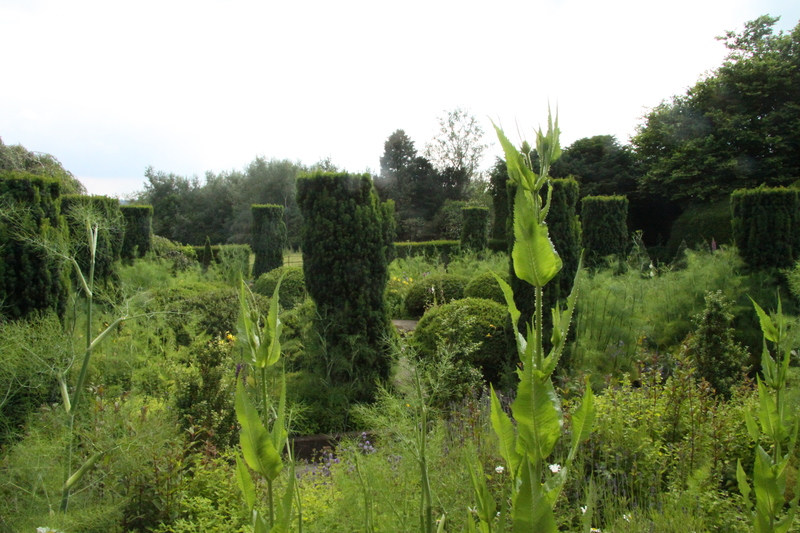 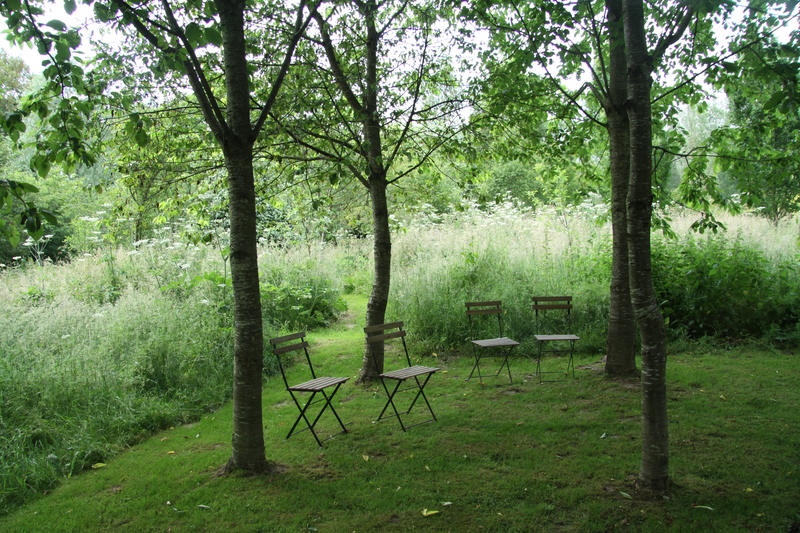 The garden at Bryan’s Ground has been developed for the last twenty years by David Wheeler (publisher of the distinguished gardening quarterly, Hortus ) and artist and garden designer, Simon Dorrell. 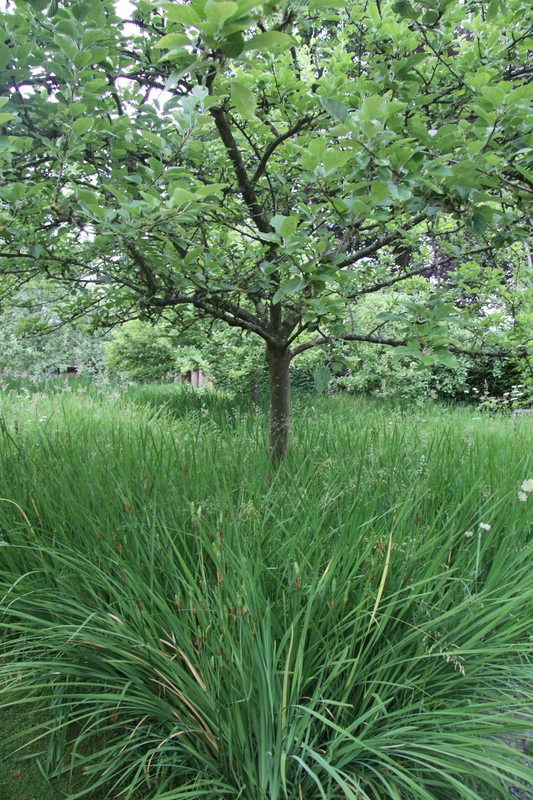 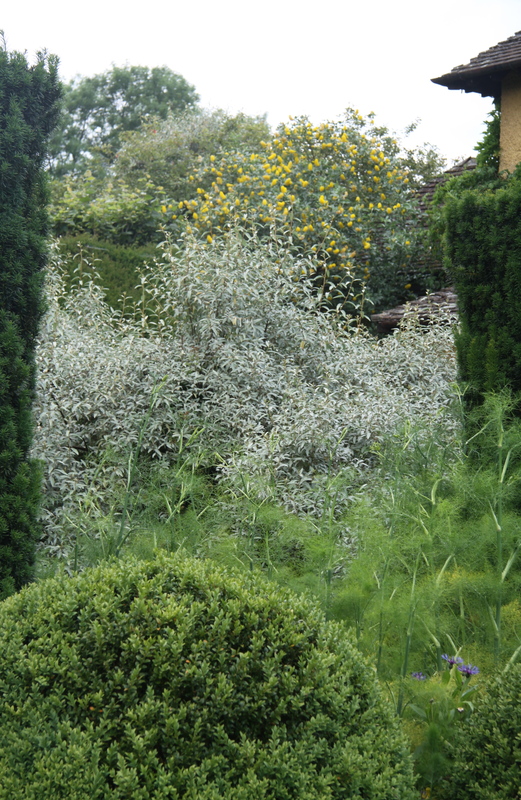 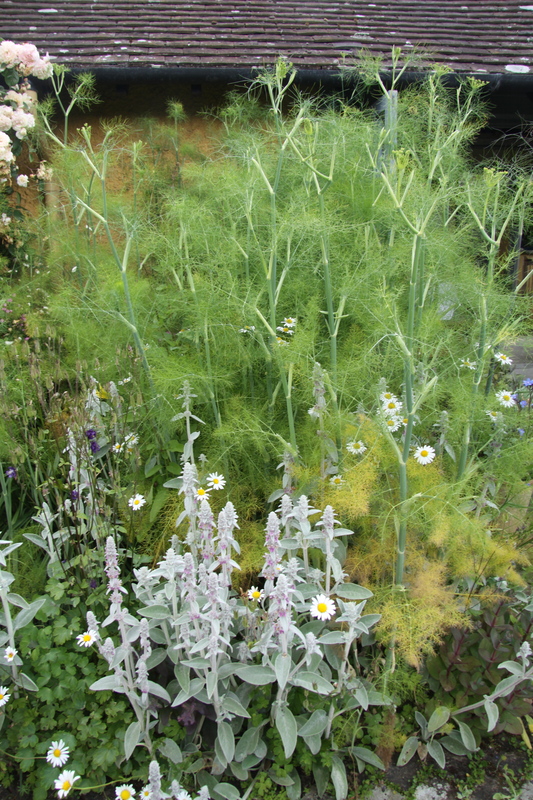 And the famous grid of 25 different apple tree which emerge from mown paths, each tree surrounded by a private sea of blue anemone, followed by Pheasant’s Eye narcissus, followed by show-stoppingly dense planting of the slender, pale blue Iris sibirica ‘Perry’s Blue’ – is now quietly lush. 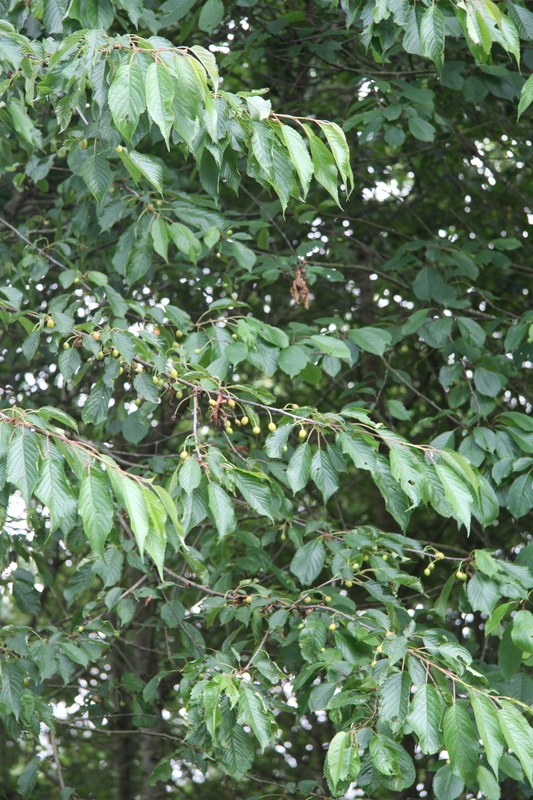 But it does not take long to warm us up. 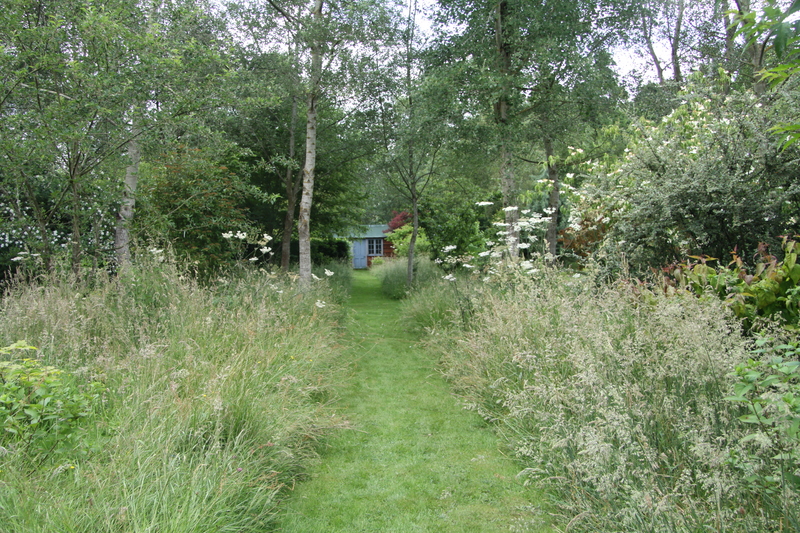 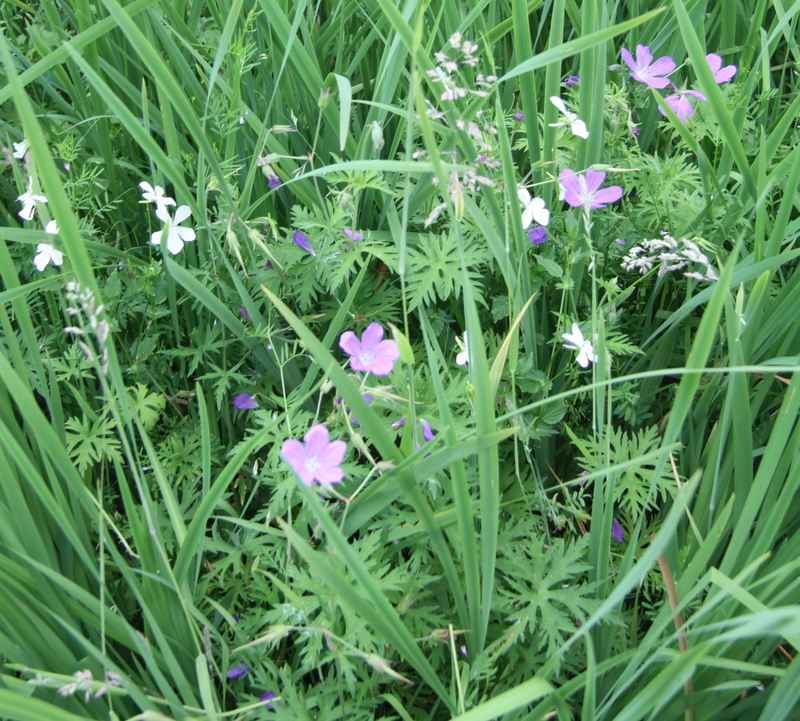 Looking more closely, the planting around the apple trees is now laced with pale pink field geraniums and softly fluttering tall grasses are now taking over as quieter, paler stars amongst the stiffer stems of the flowered iris. 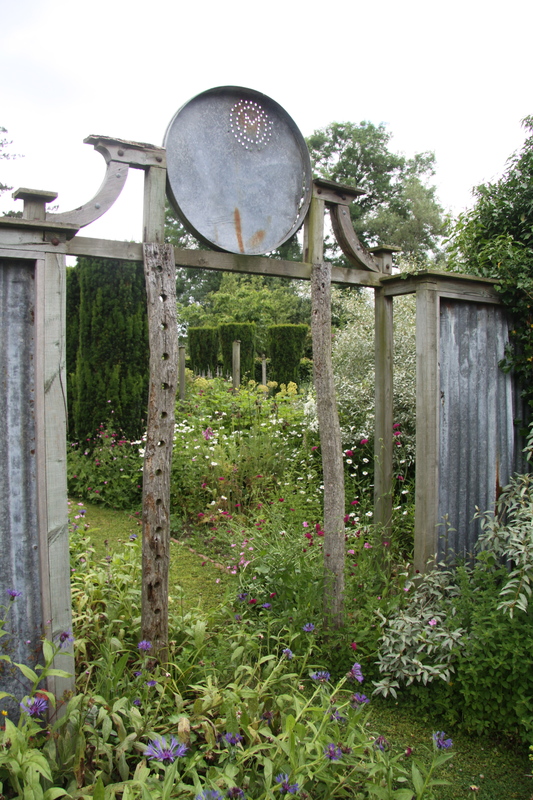 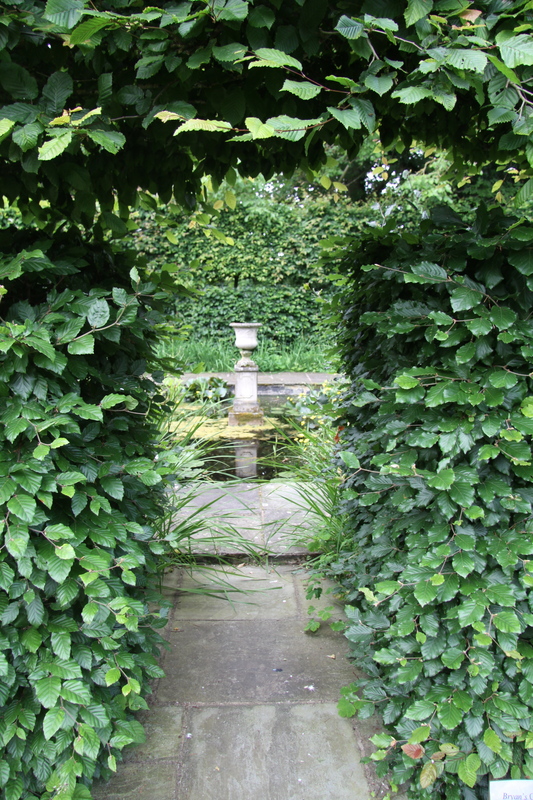 The archway has been built, beautifully, sturdily in the same handsome Dutch/Herefordshire vernacular as the ‘dovecote’ which lures you to enter the main part of the garden. 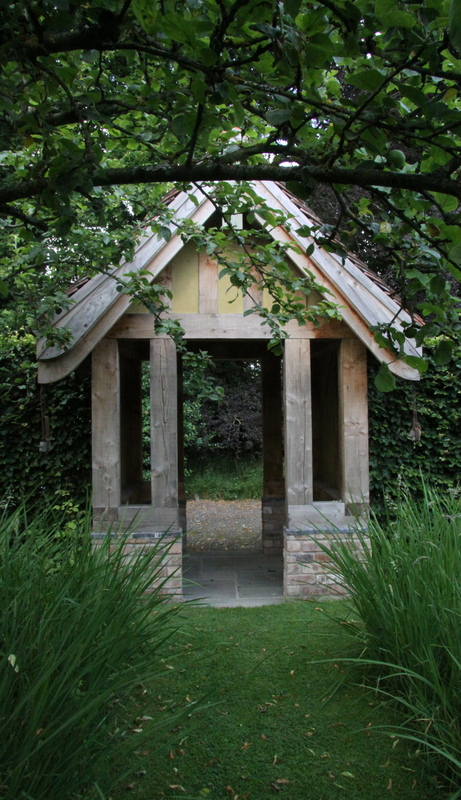 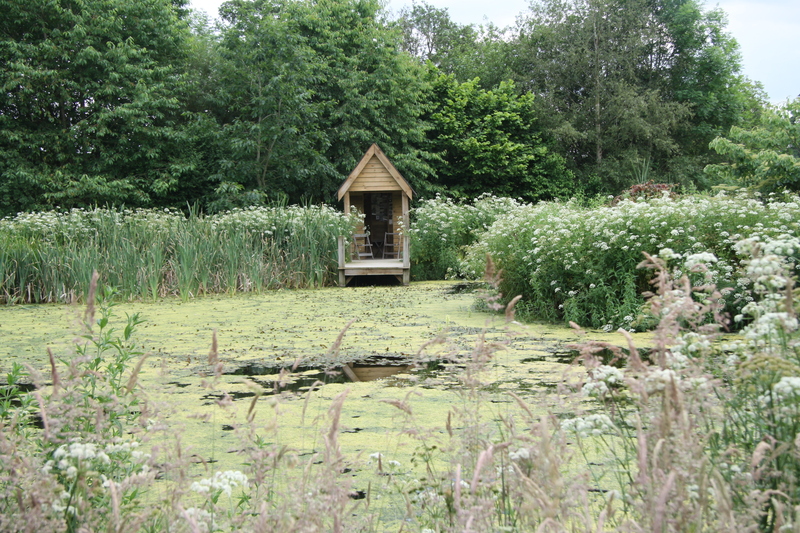 The Dovecote has it all – which is when you remember why this is a garden of inspirational confidence and charm. 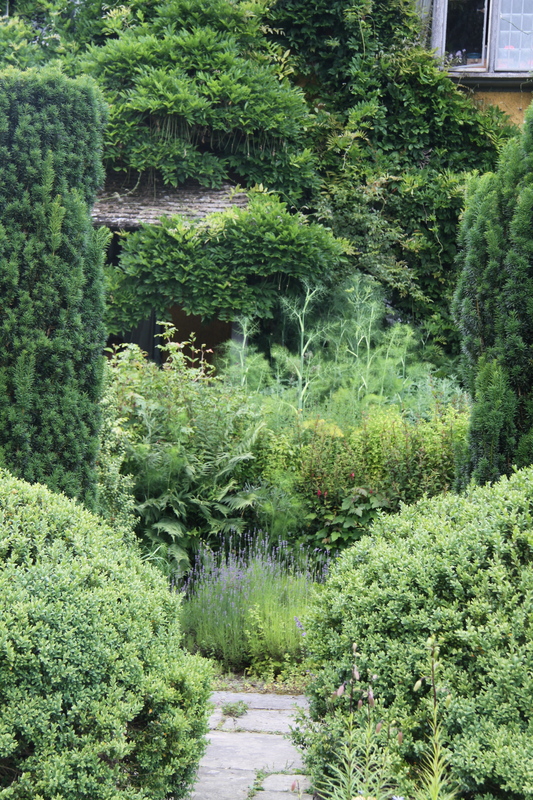 It is a focal point from and axis into three sides of the garden – each with its own flavour – and what is most covetable, perhaps, is that on the first floor there is a small dining room with idyllic views onto the Welsh Marches beyond. 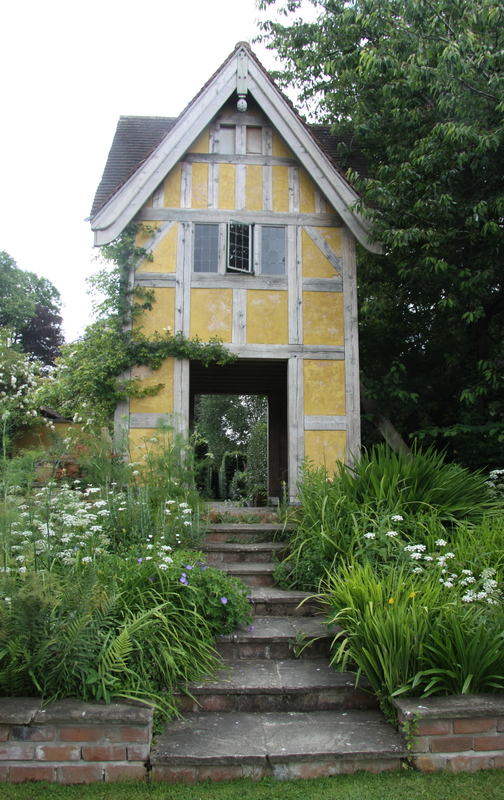 For a moment I look back to see the dovecote nestling happily in stands of campanula and draped in roses. 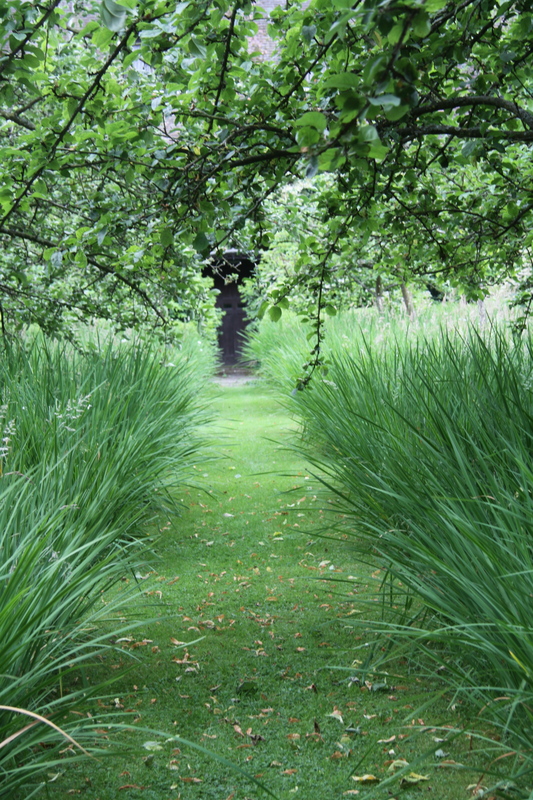 No need to worry about missing the iris moment – which is brilliant and absolutely worth making a pilgrimage to see – the new midsummer fairy tale version of Bryan’s Ground is just unfolding. 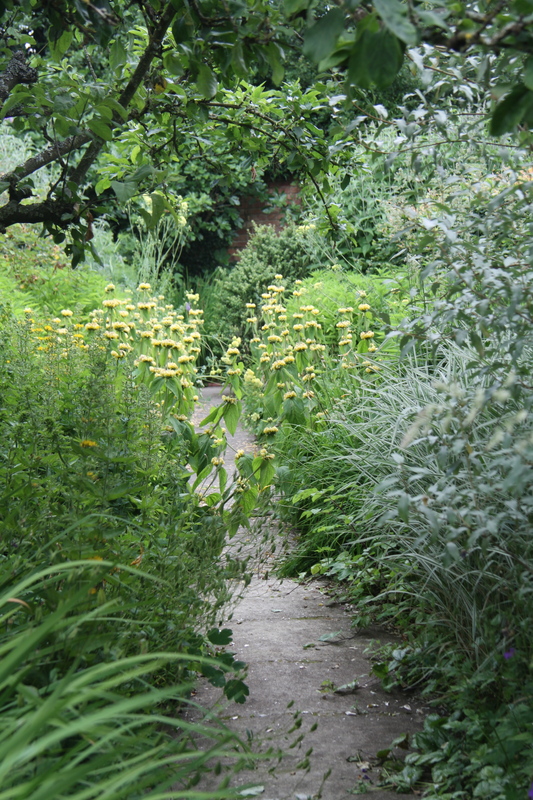 In the spring, Lime Alley is singing with orange tulips, acid yellow Euphorbia polychrome and rich yellow azaleas but now it is calm and ordered, a perfectly judged break between the exhilarating Sunk Garden and the other midsummer rooms to come. 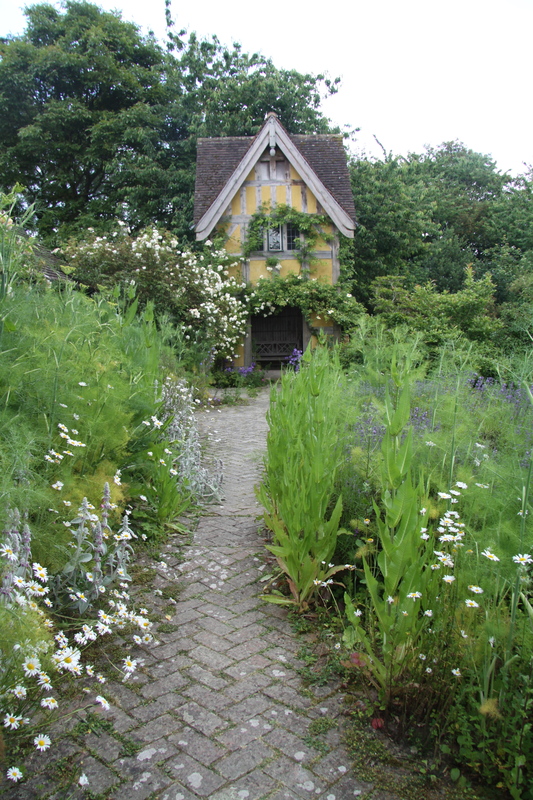 – And yet there is a constant supply of surprise and invention too. 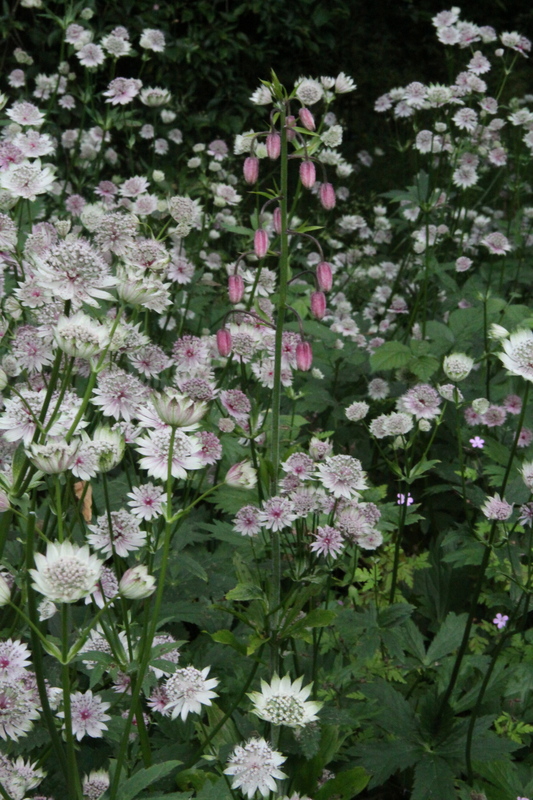 Again we have missed the further swathes of Iris sibirica and what must have been a delicate knee-high forest of aquilegia in May. 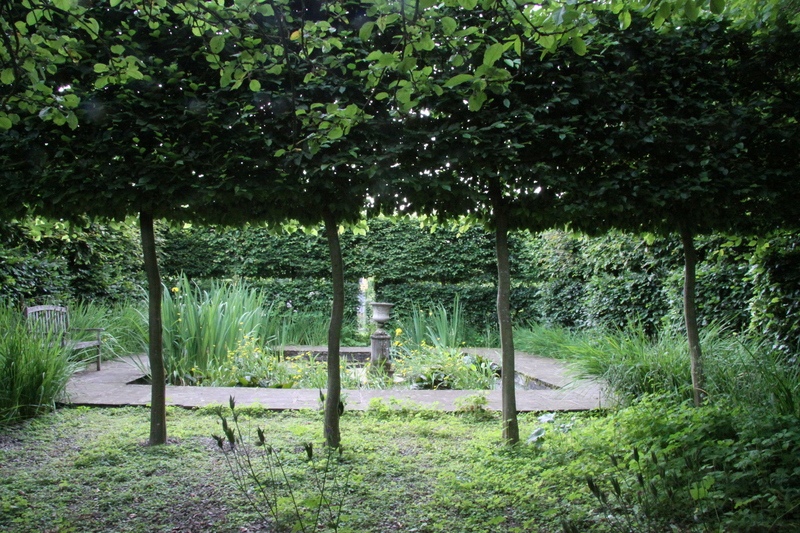 But the scene, here immaculately framed by a stilted hornbeam hedge and viewed from a perfectly place bench, is wonderfully restful. 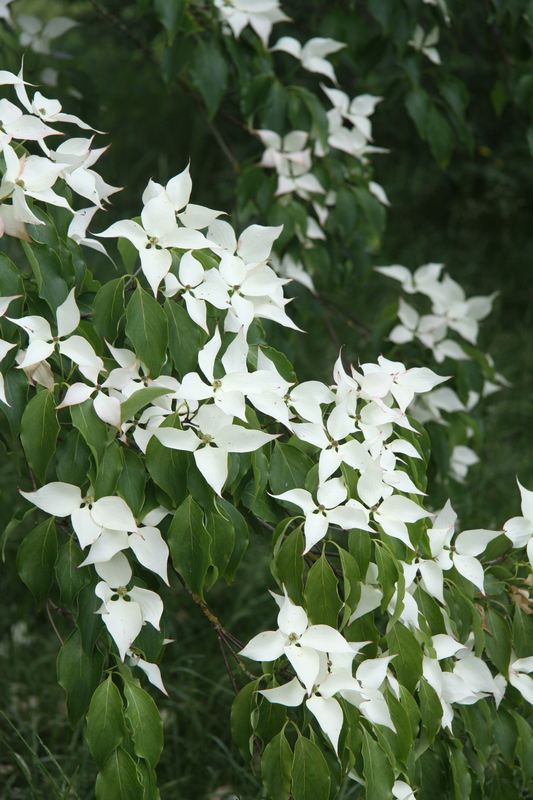 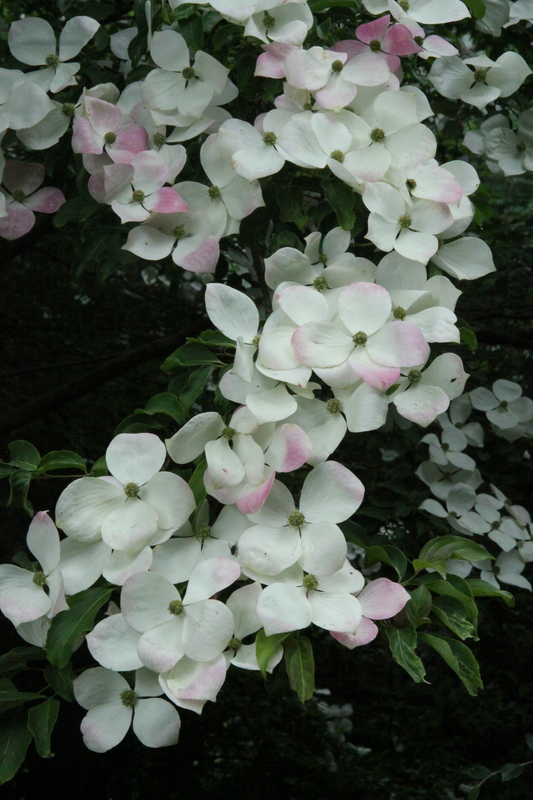 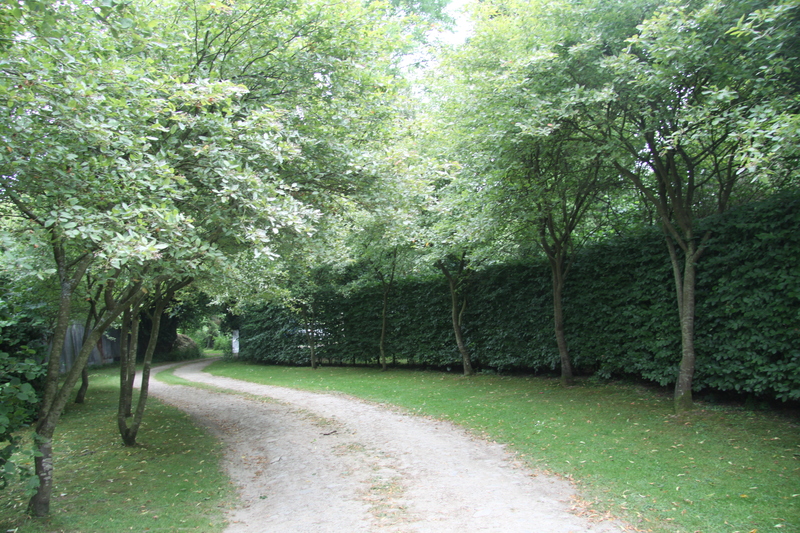 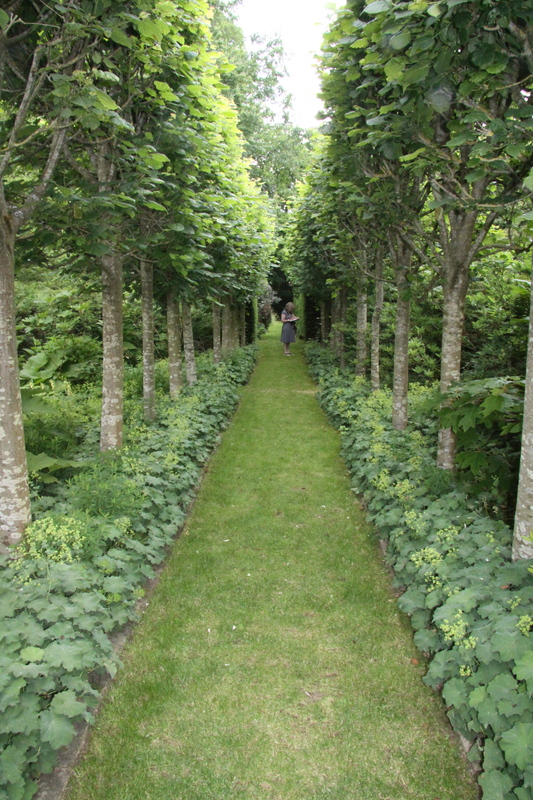 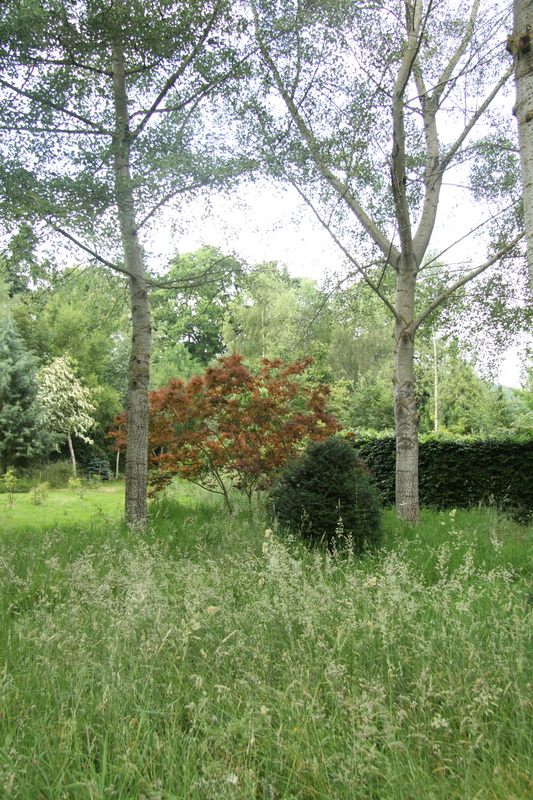 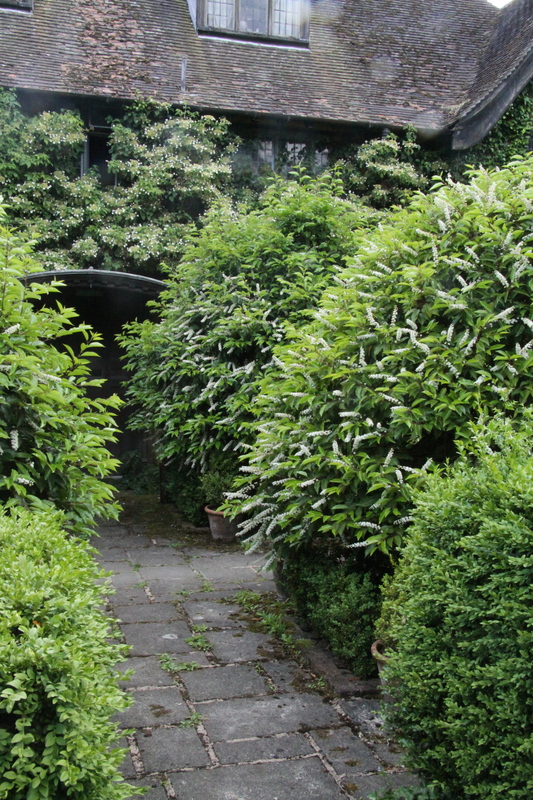 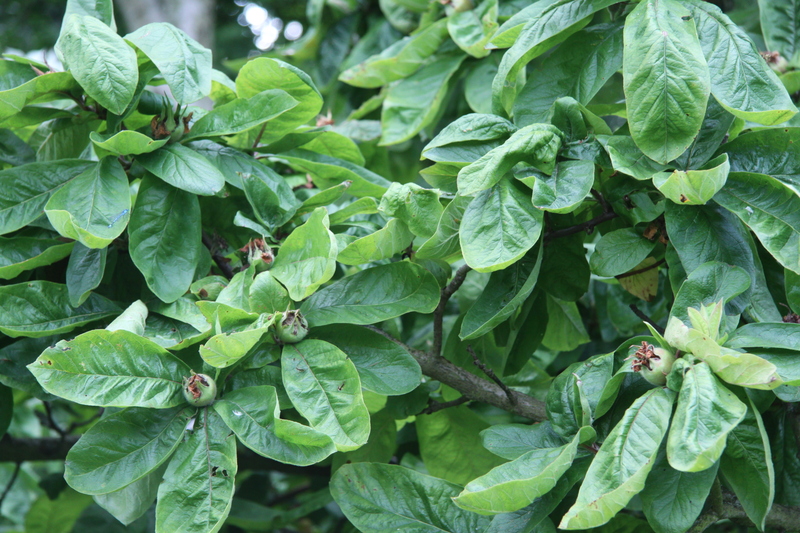 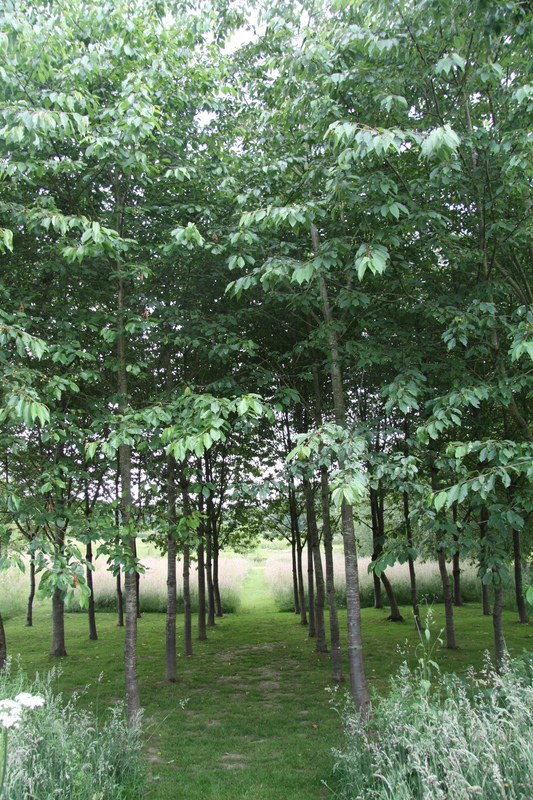 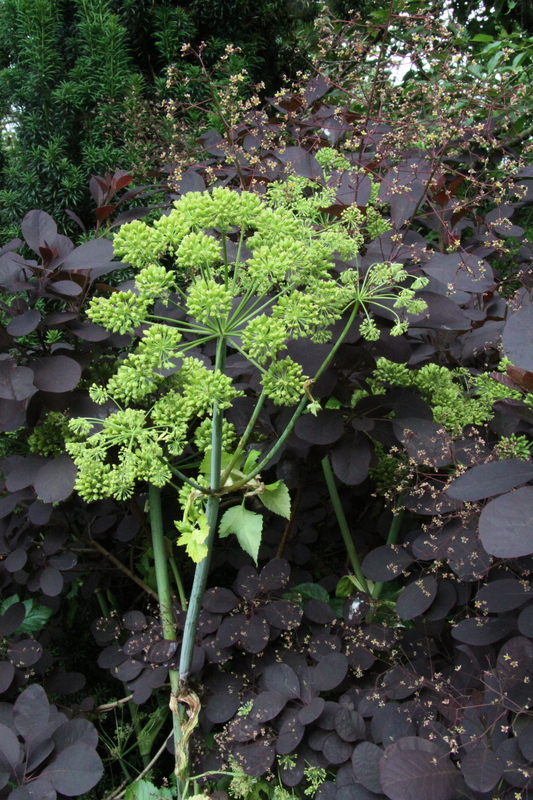 As we move away from the garden and enter the Cricket Wood – a still growing collection of specimen trees and shrubs started in 2000 – we are aware again of the intensity of a particular moment in an area of planting. 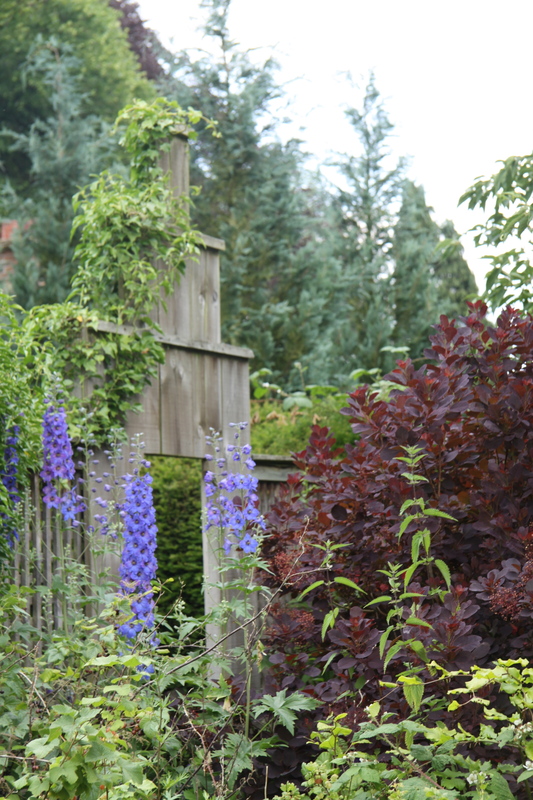 In early spring there are hundreds of bulbs in the woodland, later scented walks of viburnums and the fragrant yellow azalea, Rhododendron luteum and many of the trees are specially selected for the strength of their autumn colour. 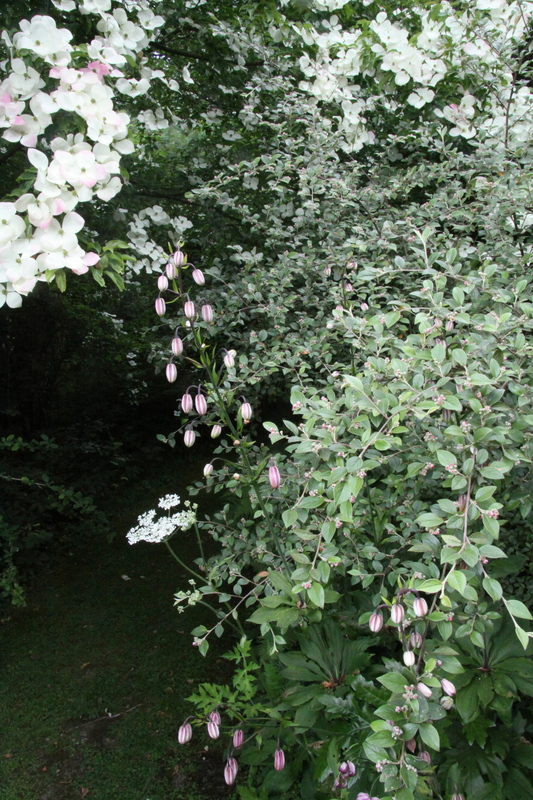 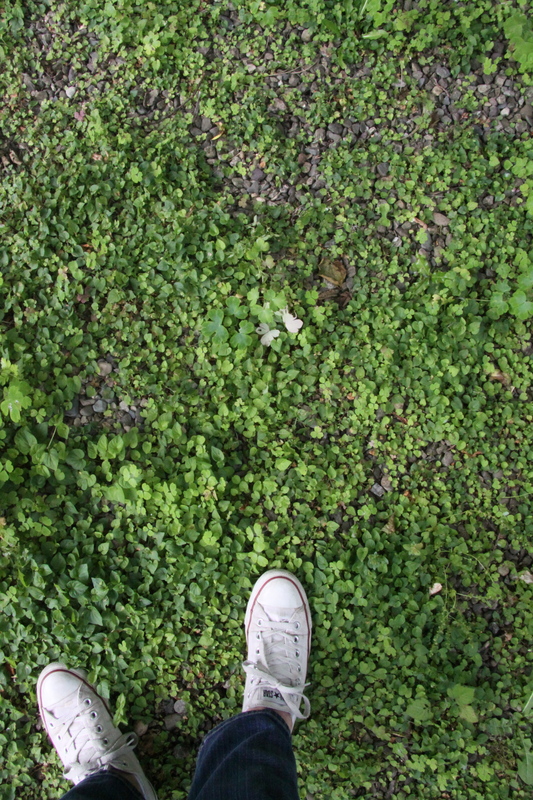 But for now the palette is subtle and beginning to fade and bleach into high summer. 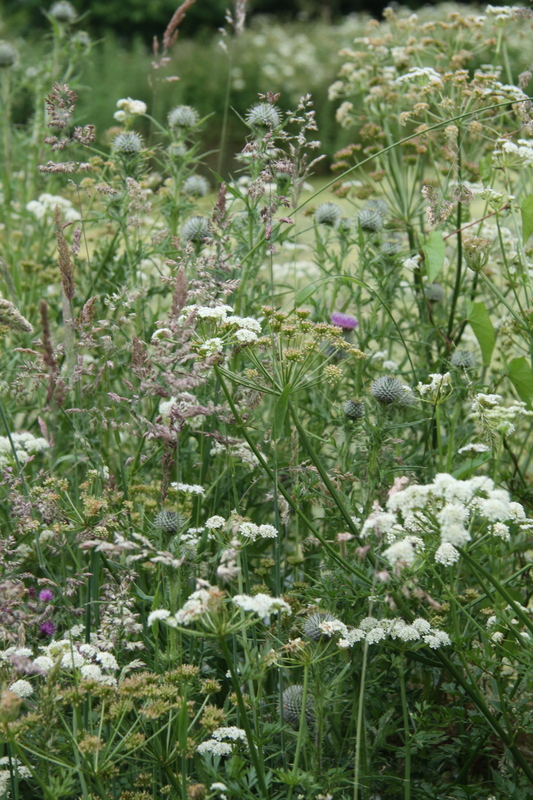 The planting around Strongacre Pool at the edge of the Cricket Wood is particularly lovely. 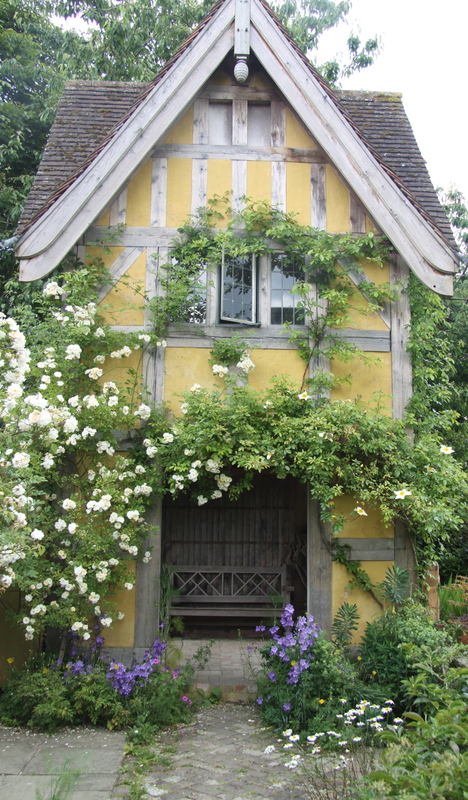 Papery pale and delicate with a boathouse to add to your dreams. 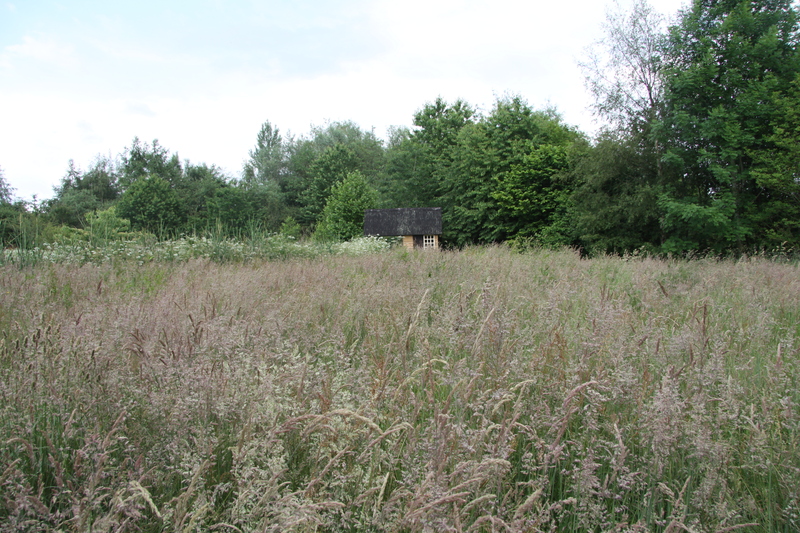 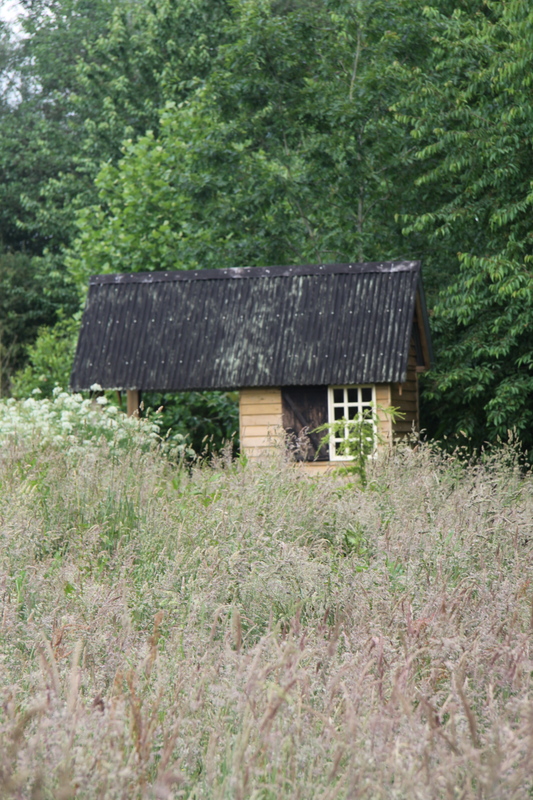 As you walk away from the boat house the little building seems to be floating in a sea of dusky pink grass. 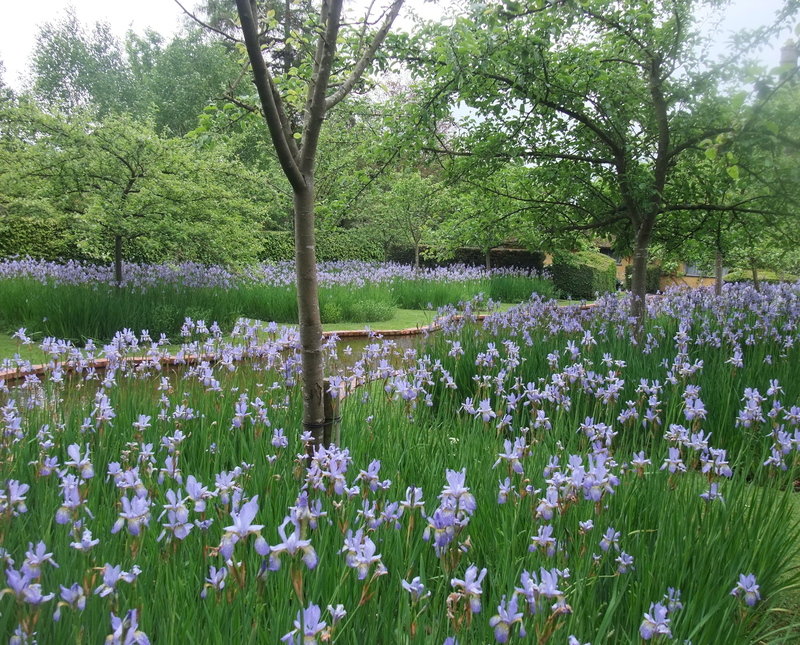 I should not have worried for a moment that missing the irises would mean missing the magic of Bryan’s Ground. 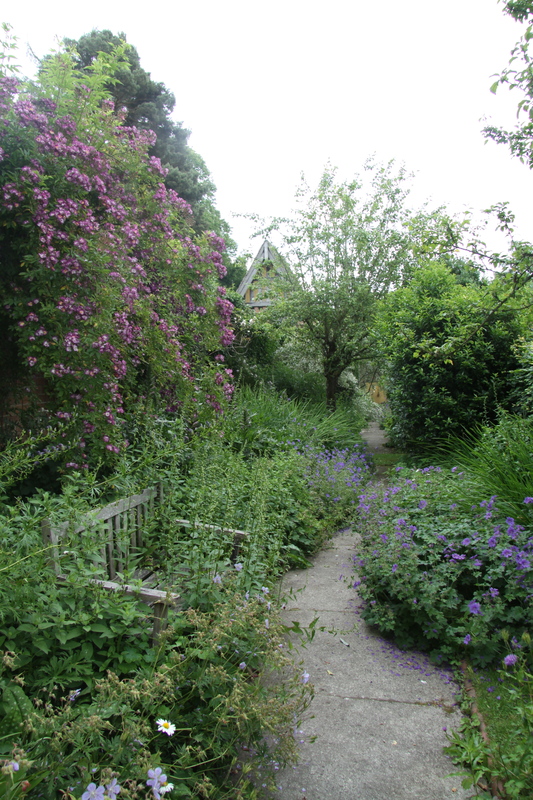 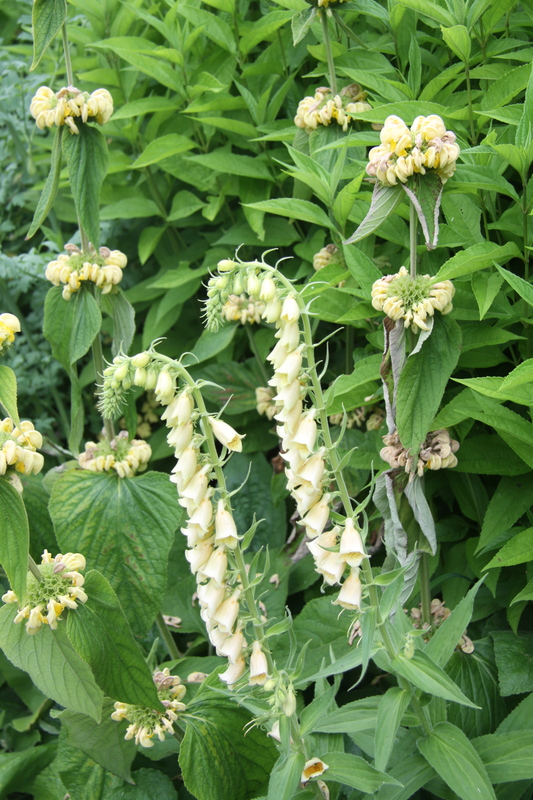 This entry was posted in Gardens and tagged Alchemilla mollis, Amelanchier avenue, Amelanchier lamarkii, Arts and Crafts, bird cherry, Bryan's Ground, campanula, Cornus 'Norman Hadden', Cricket Wood, Crocosmia, Cytisus battandieri, David Wheeler, Dipsacus fullonum, dovecote, dovecote dining room, Elaeagnus 'Quicksilver', Geranium psilostemon, Hortus, Hydrangea petiolaris, Iris sibirica 'Papillion', Lime Alley, loggia, martagon lily, midsummer, Pheasants Eye Narcissus, phlomis russeliana, Pineapple broom, Presteigne, prunus avium, Prunus lusitanica, Simon Dorrell, stachys byzantina, stilted hornbeam hedge, Strongacre Pool, Sunk Garden, Teasel, The Mezquita, topiary hawthorn, Welsh Marches on June 30, 2014 by nonmorris.